Star Warz has been hosted by all the biggest labels in the Drum ‘n’ Bass scene & has been partner of the mighty Tomorrowland festival for many years. For this edition, they are once again teaming up with another leading player in the worldwide Drum ‘n’ Bass scene namely Outlook Festival. Outlook Festival is Europe’s largest Drum ‘n’ Bass & Dubstep festival, held in Fort Punta Christo by the coast in Croatia. A true bass fest just like Star Warz. Last year Star Warz hosted 2 stages there and they will do so again this year. 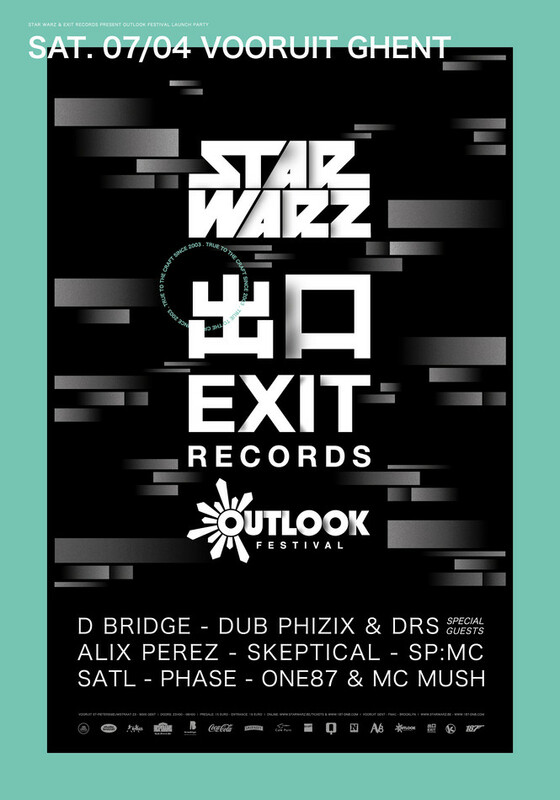 Both Outlook and Star Warz are honored to welcome Exit Records for their joint-venture in one of the most beautiful party venues in Belgium, the Vooruit. Exit Records is the product of a life-long love affair with music for Darren White (aka dBridge). Since its inception in 2003, Exit has become renowned for forward-thinking music and setting high standards in production and presentation. The Exit Records club nights have become extremely popular with a star studded selection of the scene’s most influential DJ’s operating in and around the edges of 170 BPM electronic music. With highly praised nights and stages across the UK and Europe including Outlook, Dimensions, & Sun and Bass festivals, A Bunch Of Cuts, & a residency at Fabric, the labels line-ups have become firm favorites for their unique vibe. A veteran producer and one of the most experienced artists in Drum & Bass, Darren White known as dBridge, is an artist whose multiple transformations and evolutions glide through a staggering list of achievements. Over the course of a long and distinguished career, he has been at the heart of some the most exciting collaborative partnerships Drum & Bass has ever seen, from Future Forces to Bad Company and Club Autonomic. dBridge has also devoted a large amount of focus to his label Exit Records, releasing compilations, ground-breaking singles, and artist LPs as he continues to mentor a new breed of producers inspired by his career. To that end, he launched the collaborative 'New Forms' project with Kabuki and also works with Native Instruments creating sounds and packs for their 'Maschine' hardware. As a solo artist, dBridge remains versatile with his own productions for labels including Exit, Metalheadz, R&S Records, Hotflush and many more, and continues to drop equally diverse and genre defying DJ sets at events across the world.. The creator of a new style of Drum and Bass music that fuzes influences from all corners of the globe, Manchester based Drum & Bass producer Dub Phizix began his obsession with music over 20 years ago. By 10 years into his career, Dub Phizix was an accomplished producer having made music in a variety of styles for MTV, BBC and Nokia. Forward to today and Dub Phizix is releasing music on his own SenkaSonic label and other respected outlets such as Exit, Soul:R and Critical, with Mixmag calling his music 'Essential material'. His remix portfolio is also impressive with reworks for Atlantic Records, Hospital Records, Panjabi MC, Sizzla, and more. Alongside his partner in crime Strategy, Dub Phizix is responsible for monster tracks: Marka and Buffalo Charge. This duo’s unique style makes them firm favourites for both Drum & Bass and mixed genre stages at the biggest clubs and festivals going. Alix Perez is regarded as one of the most ground-breaking and innovative producer/DJ’s of his time. Alix released his debut album “1984” to critical acclaim via the much revered imprint Shogun Audio in 2009. Since then he has risen to a constant high, and has collaborated with the foremost names in dance and electronic music such as Noisia, Foreign Beggars, dBridge, EPROM, Peven Everett and many more. 2016 saw the launch of Alix’s own imprint: 1985 Music. 1985 Music got off to a running start. Every release and all merchandise into 2017 having sold out, and the label has firmly made its place as a more discerning and entrepreneurial establishment. Almost every release has found its way to number 1 in the Beatport charts. SHADES (his project with EPROM) has seen Alix tour the US 3 times in 2017, and will see him cross back over the Atlantic a few more times again this year. Early 2015 saw Alix releasing his Bandcamp exclusive “Surplus One” EP. This is another forward thinking collection of music which pushes the boundaries of the genre further, and solidified his reputation as an experimental and highly progressive artist. As a DJ and producer whose natural passion for music in all its forms eventually spilled over into a full blown production habit, Skeptical has been responsible for some of the most damaging yet delicate tracks occupying the realms of current Drum ‘n’ Bass. From the deadly ‘Blue Eyes EP’ on Ingredients Records, to a slew of impeccable releases on highly esteemed imprints such as Exit Records, Dispatch, Renegade Hardware, and with releases on Soul:r & Samurai, Skeptical has smashed it out for almost every dark Drum ‘n’ Bass label worth its salt. His work with all these labels has seen him remix tracks from a wide range of producers such as Jubei, Jamaican reggae artist Sizzla and more recently Zed Bias. In 2017 he was voted ‘Best Alternative Artist’ at the Drum & Bass Awards UK. DRS presides over a flawless 15 year career, widely regarded as one of the best, not just in Drum & Bass, but across the board. Hot on the heels of his triple Drum & Bass Arena award win (for ‘Best Vocalist’, ‘Best MC’ and part of the 'Best Remix'), setting the pace with an unmatched back catalogue featuring classic upon classic upon classic. A long time friend, collaborator and host for the likes of Marcus Intalex & Calibre, DRS is most closely associated with the Soul:R imprint, having released two albums, landmarks of their kind for a host in DnB, in ‘Mid Mic Crisis’ and ‘I Don’t Usually Like MCs But…’. SP:MC’s passion for the music undoubtedly comes through on the mic. With a unique flow and the confidence to leave space for the beats to breathe, it’s clear that SP is an MC who only compliments and never competes with the DJ. With a deep understanding of the music he’s so passionate about, SP has proved himself to be a talented producer in his own right. You can find his releases on Tempa (alongside Joker D), Shogun LTD (with Jubei and Dakuan as Code3) and D-Bridge's Exit Records amongst others. At the tender age of only 21, SATL has already fashioned a body of work to be proud of, and shows a maturity to his sound and musical approach that belies his newness to the game. His ear for a strong hook and sample is evident across his work, and he has already produced a number of tracks that are consistently being drawn by a wide range of DJs, and have been released on leading labels such as Integral, Shogun Audio The North Quarter and Fokuz. With obviously still a huge amount left in the tank, he is sure to be a figure to watch very closely in the next couple of years. Hailing from Ghent, Phase quickly gained the support of big acts such as Break, Total Science, DJ Marky, LTJ Bukem, Murdock and many more. His production techniques are impeccableand had him signed tracks to leading record labels such as 31, Goodlooking, Radar, Demand, as well as collaborations with Athys & Duster, Bredren, Mzine & Scepticz. His productions are characterized by a deep seated love for jazz and rhythm, but in his dj-sets he explores all kinds of Drum ‘n’ Bass. Resident One87 will obviously also be present and do what he does best, give the Star Warz fans exactly what they came for: edgy and full on Drum ‘n’ Bass at its best. And MC Mush will perfectly join him on that graveyard quest. So get warmed up for a 'summer festival feeling' and get a glimpse of what you could also be experiencing from September 5th till 9th in Croatia! In usual Star Warz style and heat!